93 min [ DESPERATELY they fought the desires, the passions that dragged them down deeper and deeper into... " ] - On a gray morning, a circus caravan arrives in the town where Albert the ringmaster's family lives. He hasn't seen them for three years and has taken a mistress, the young and buxom Anne. 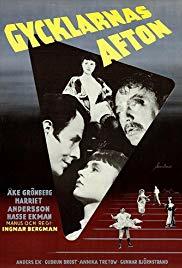 Albert calls on his wife; Anne, jealous and wanting out, visits a theatrical troupe and lets an actor, Frans, seduce her in exchange for a necklace he says is valuable. Anne finds out it's worthless at about the same time Albert's wife declines to let him live with the family. Albert and Anne are stuck with the circus and each other; there's a show tonight, Frans will be there smirking and sardonic, the bear is mangy, the clown is as sour as they come, and suicide offers an exit.